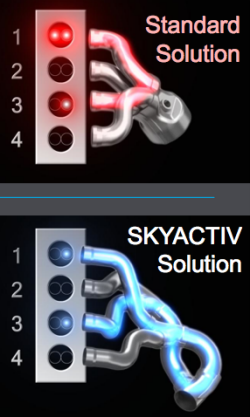 What is Skyactiv, besides yet another misspelled bit of branding by a multinational corporation? 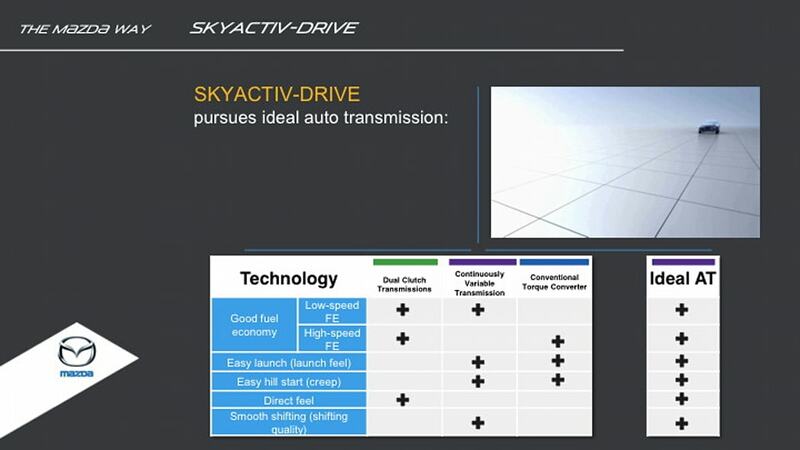 The answer is that Skyactiv is a lot of things, but, in short, its Mazda's long-term energy efficiency strategy, and it's unlike any other plan from a major automaker. 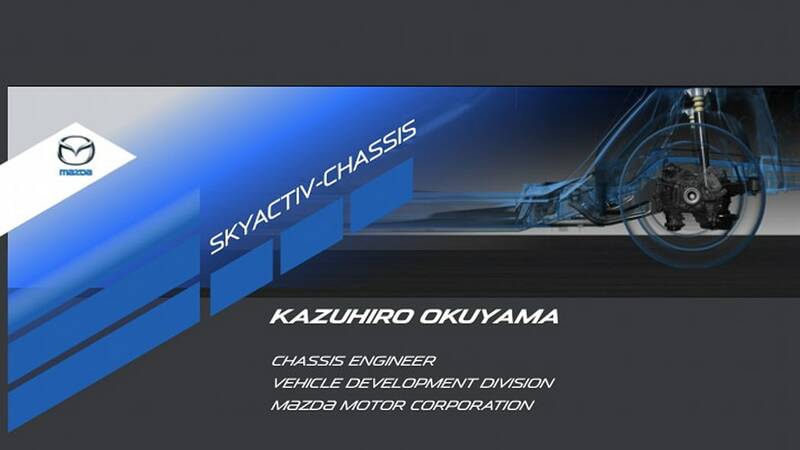 From an engineering point of view, Skyactiv is looking 25-30 years down the road, imagining the ideal vehicle at that time, backing away from that until you meet what's possible today – then finding a way to build that with Mazda's Zoom-Zoom personality intact. 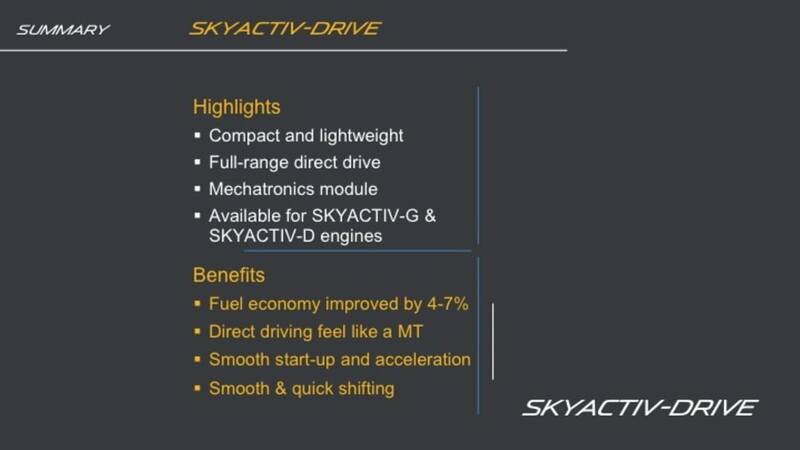 From a business perspective, Skyactiv is a low-risk strategy that, potentially, sets up a big windfall for the company in the coming years. The reason is that Skyactiv is – for now – all about building highly efficient internal combustion engine vehicles, both gas and diesel; plug-ins and hybrids are not yet a part of Skyactiv (remember Not Electric. 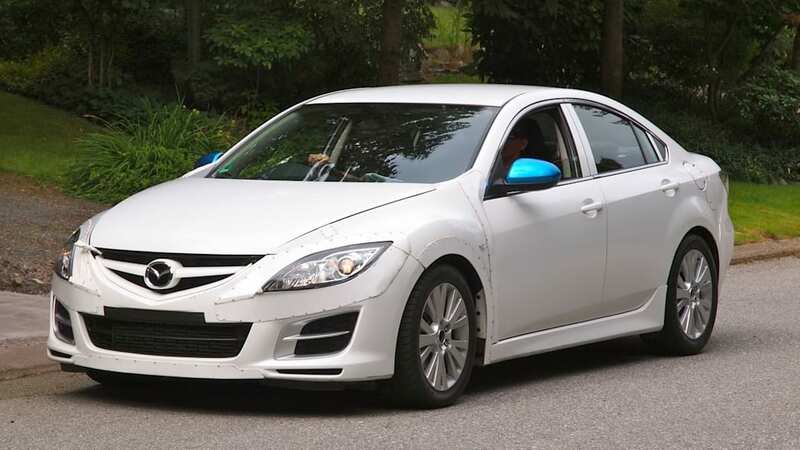 Not Hybrid. 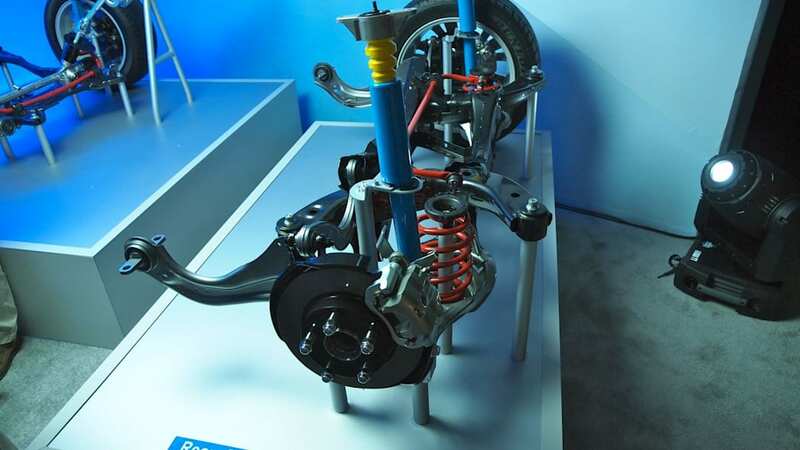 Not A Drag To Drive from the New York Auto Show earlier this year?). 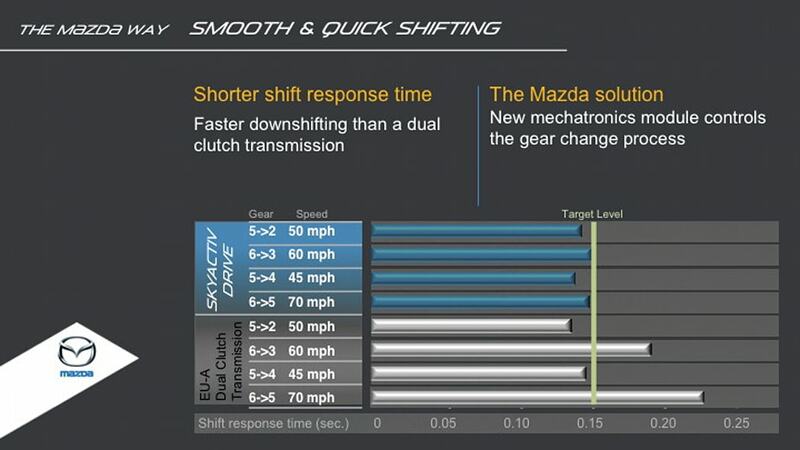 As Mazda USA's director of communications Jeremy Barnes told AutoblogGreen during a Skyactiv briefing in Vancouver this week, "You can't out-Toyota Toyota and you can't out-Honda Honda. You've got to be you." And what is Mazda? 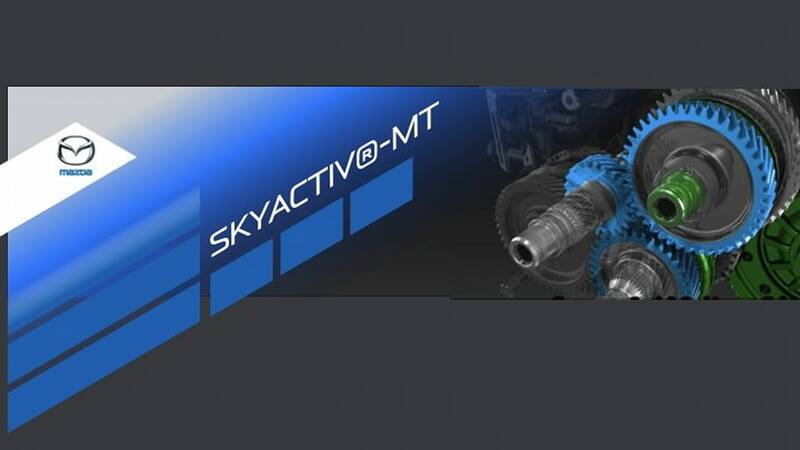 A company that's insistent that it can meet the ever-increasing fuel economy levels that regulators and customers demand using Skyactiv ICEs. 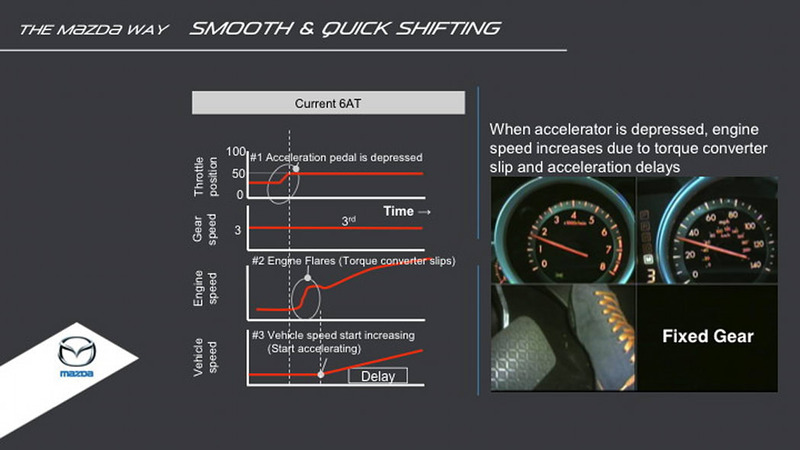 Read all the reasons why after the jump. 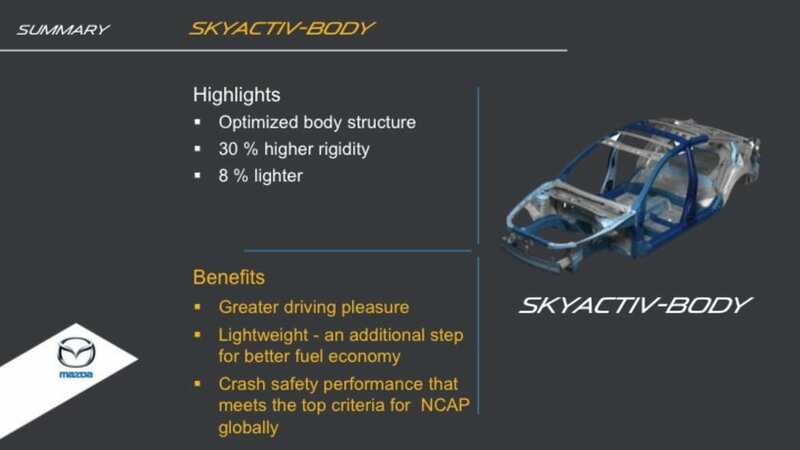 Before we get into the big picture stuff, we should make it clear that there are four legs of the Skyactiv chair today: engine, transmission, body and chassis. 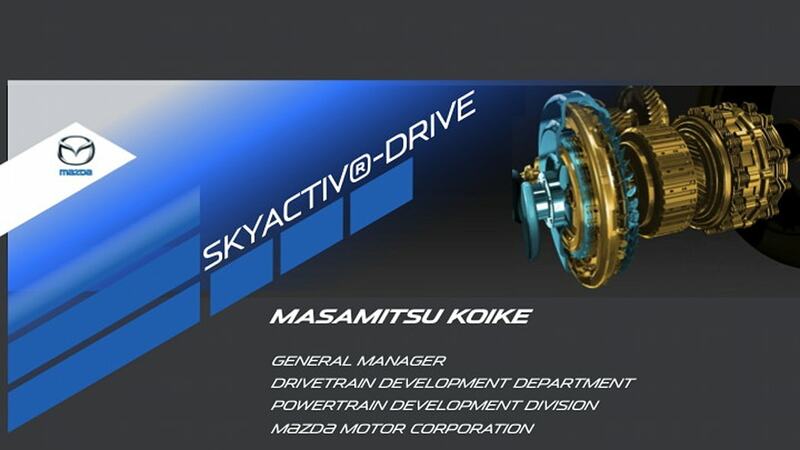 In Mazda's terminology, these are (in order) Skyactiv-G (gas) / Skyactiv D (diesel); Skyactiv-Drive (automatic) / Skyactiv-MT (manual); Skyactiv-Body and Skyactiv-Chassis. Because Skyactiv is a long-term "building block strategy," the presentation we saw did include vague mentions of plug-in, hybrid, hydrogen and even rotary engines somewhere down the road, but no one is saying when, exactly (you want details? So did we, but all we got was bupkis other than an "every one of them is in the development cycle" from Barnes). So, for now, all we really know about Skyactiv is how the four main components will make upcoming Mazdas cleaner to drive. 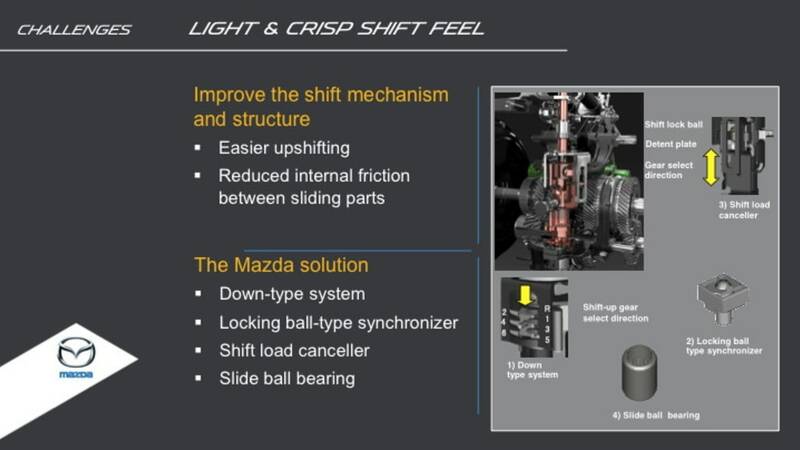 If you want all the official information direct from Mazda, click here or you can see detailed slides in the galleries at the end of this post. 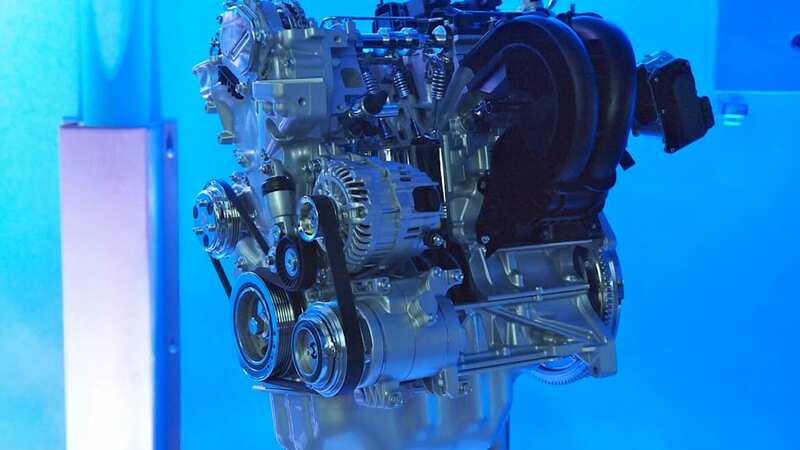 One key number for both the gas and diesel powerplants is 14. 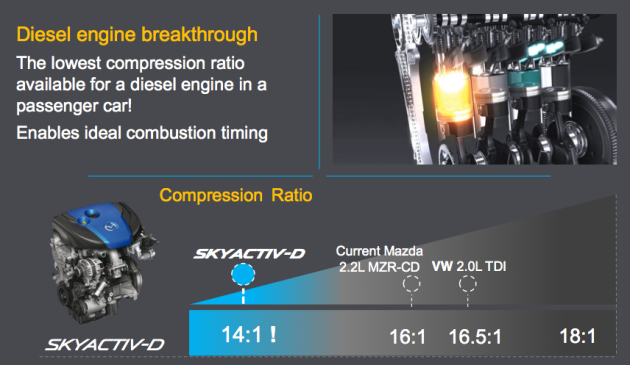 In the gasser, this is because the Skyactiv-G has an incredibly high compression ratio of 14:1, the highest compression ratio for a gasoline engine in a passenger car. 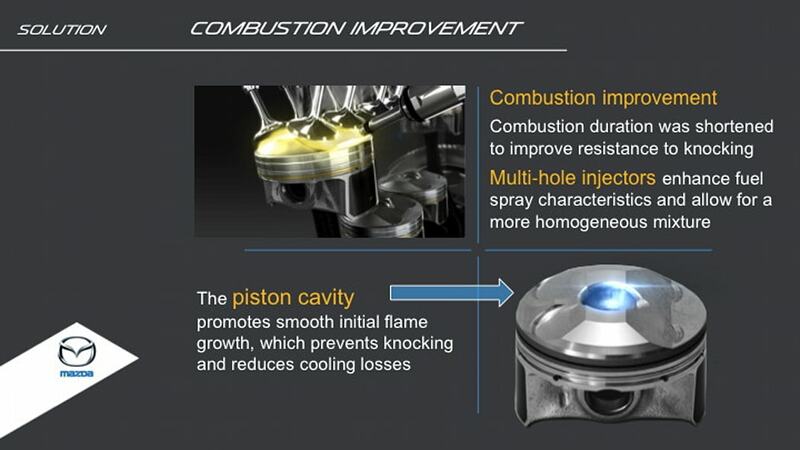 The problem is that the 14:1 compression ratio requires premium fuel (95 octane). 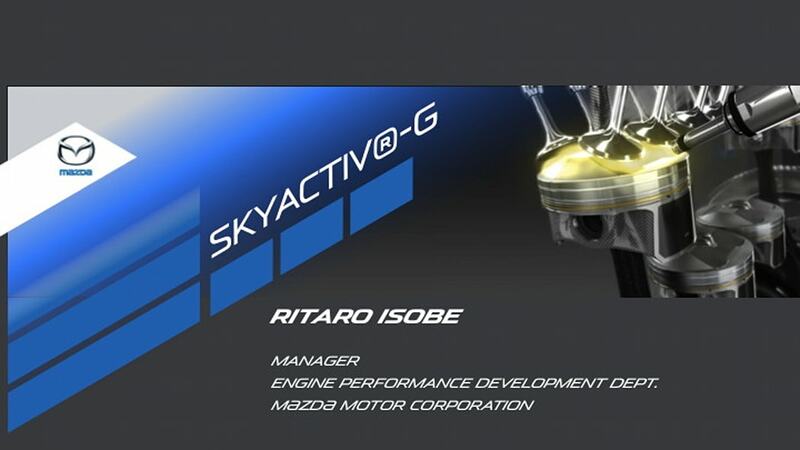 Ritaro Isobe, Mazda's manager of the engine performance development department said, "we want to offer Skyactiv technology to as many customers as possible," so the engine will be detuned to 13:1 for the U.S. market. 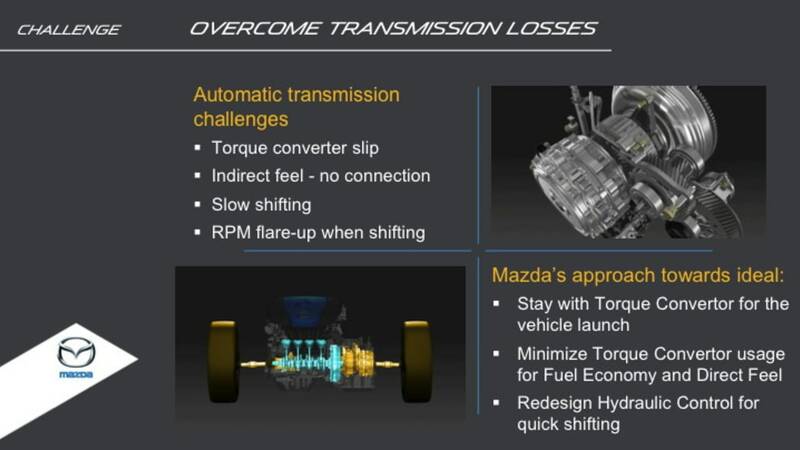 Mazda knows from experience that requiring premium fuel is a "barrier to purchase," said Barnes. 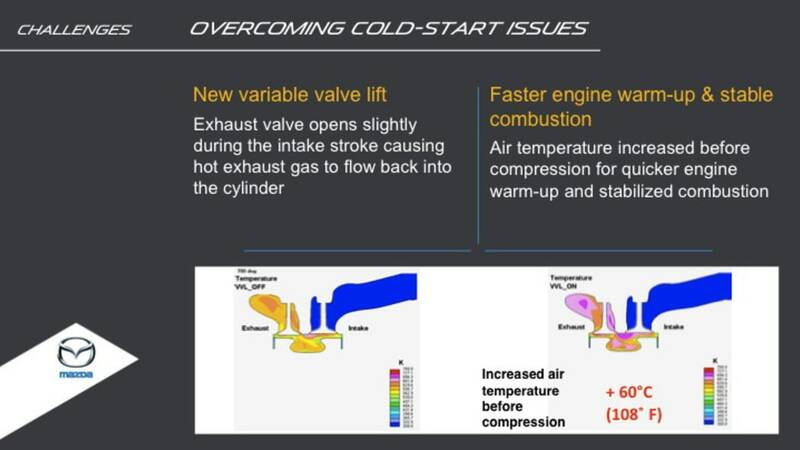 When the CX-7 was introduced in 2007, it required premium fuel; customers responded by telling the company they were buying competing vehicles like the Toyota RAV4. 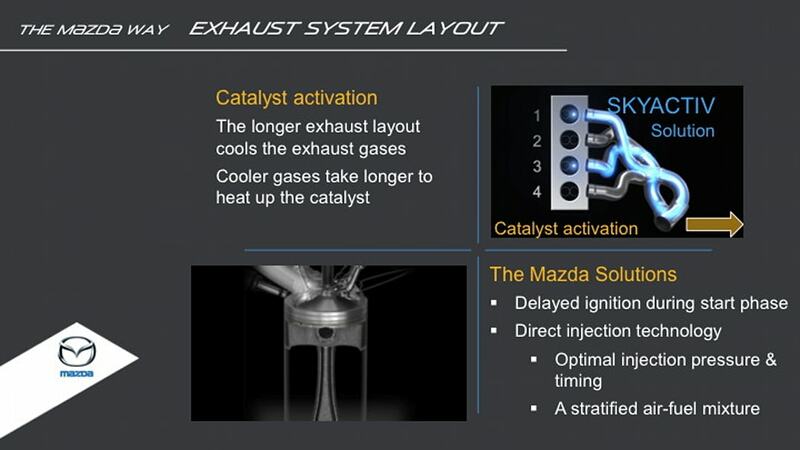 For the 2009 model year, Mazda tweaked the engine a bit and announced that the CX-7 could now accept regular fuel (premium was still "recommended," though). 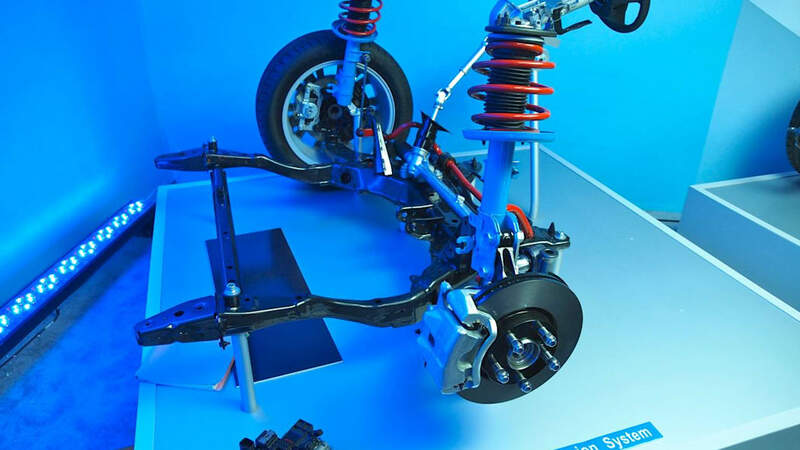 Sales increased, and a lesson was learned. Today, the only vehicles that Mazda sells in the U.S. that require premium are the MazdaSpeed 3 and the RX-8, which are special cases because they are performance vehicles. 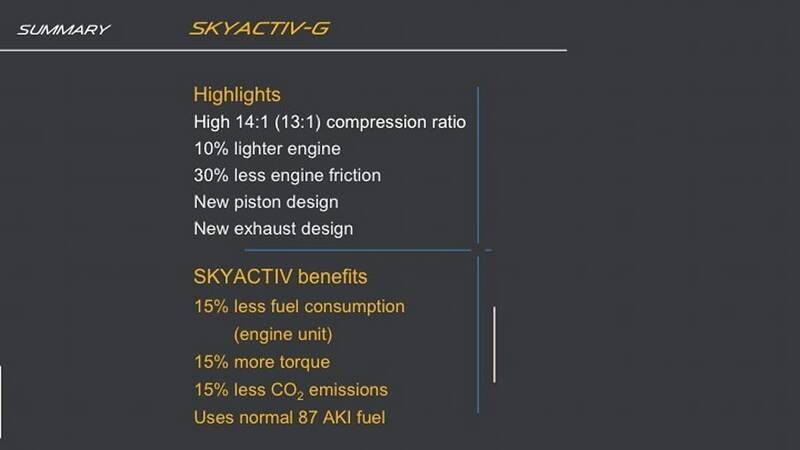 U.S. buyers will not be able to special order a foreign, 14:1 version here, but Skyactiv-G still gets you a 15-percent fuel economy improvement in the engine unit (compared to current, similar Mazda engines), along with 15 percent more torque and 15 percent fewer CO2 emissions. 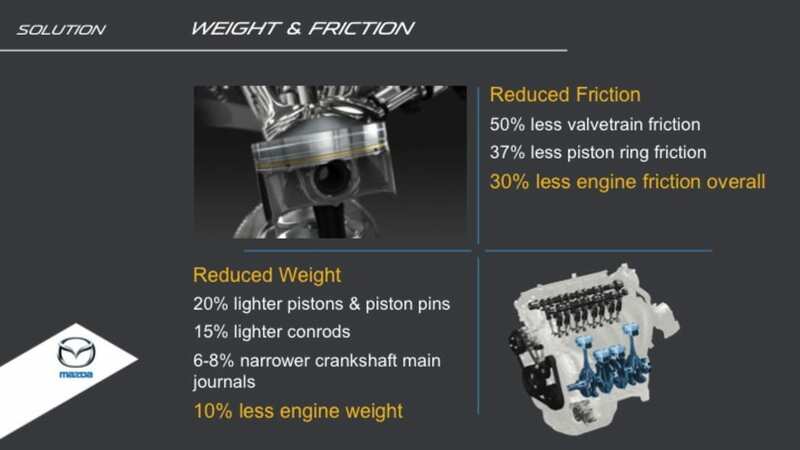 The diesel powerplants have also been similarly updated. 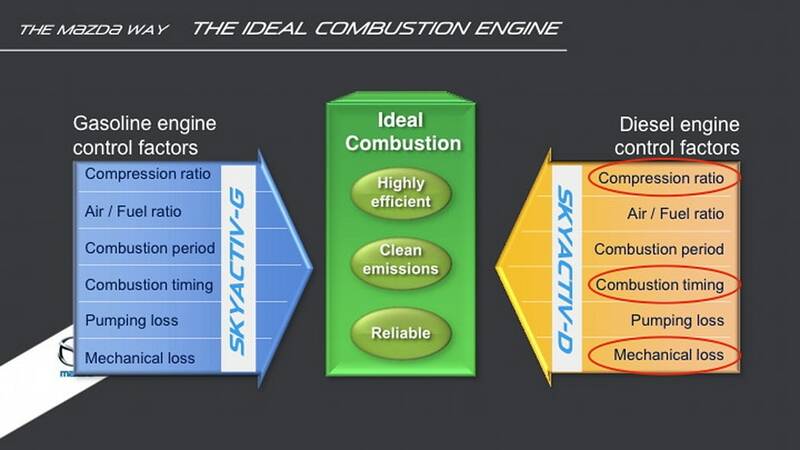 Tsuyoshi Goto, Mazda's engine design engineering department manager, said that the Skyactiv-D meets Tier 2 Bin5 emissions targets without any aftertreatment. 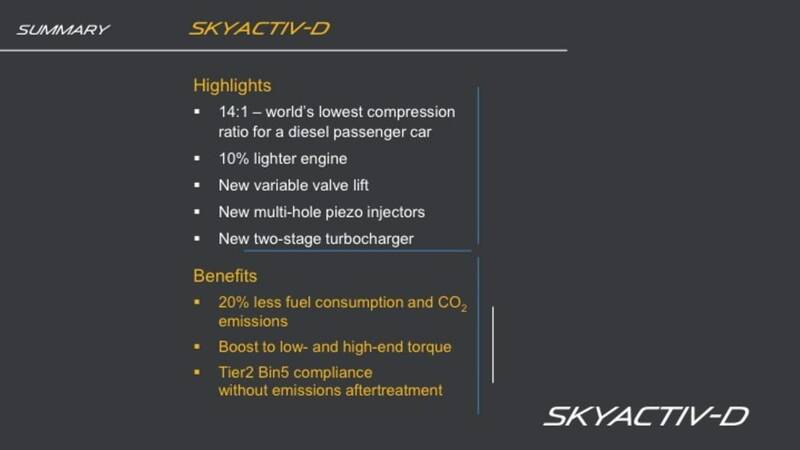 Aftertreatment emissions clean-up was eliminated as a possibility for the Skyaciv-D right from the outset, since it was not an "ideal solution," in part because it is too expensive. The good news for Mazda is that, now that the engine itself is cleaner, Mazda has the aftertreatment card up its sleeve if it needs to further reduce emissions in the future. 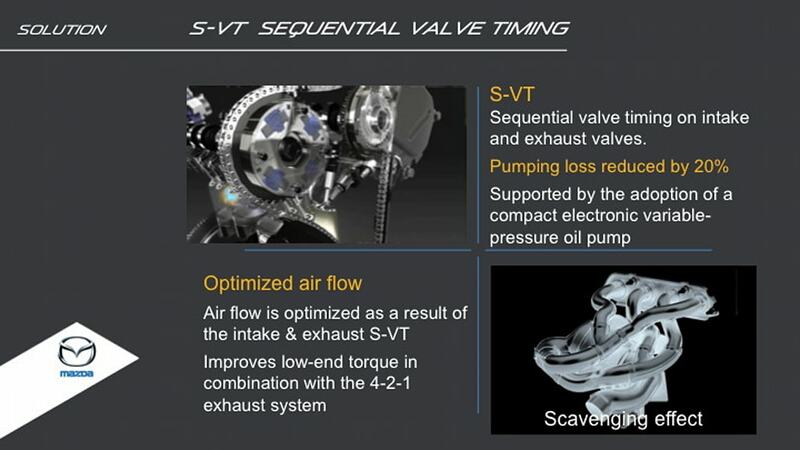 To make the engine cleaner, the engineers tried to improve the combustion timing, compression ratio and mechanical loss. 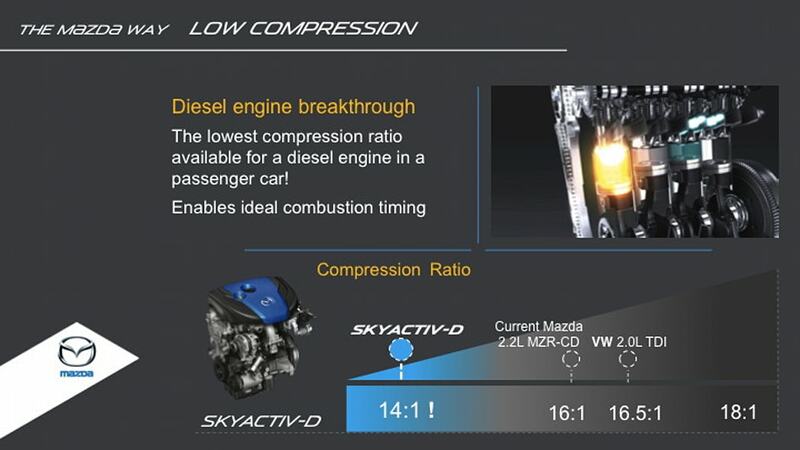 By lowering the compression ratio to 14:1 (conventional diesel engines have 18:1; some enhanced modern diesels are 16:1 or 16.5:1), the oxygen, nitrogen and fuel can mix better, which results in a cleaner burn and lowered emissions. 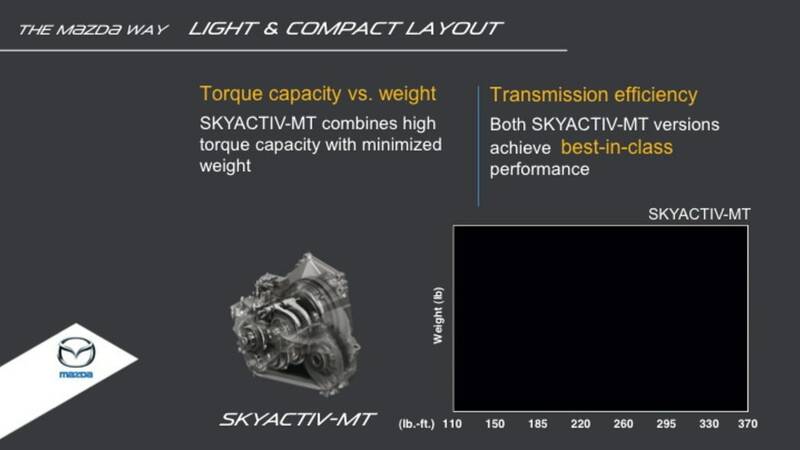 Skyactiv-D also offers better low- and high-end torque performance, Goto said, and the final product is a 10-percent lighter engine that offers a 20-percent reduction in fuel consumption and CO2 emissions. 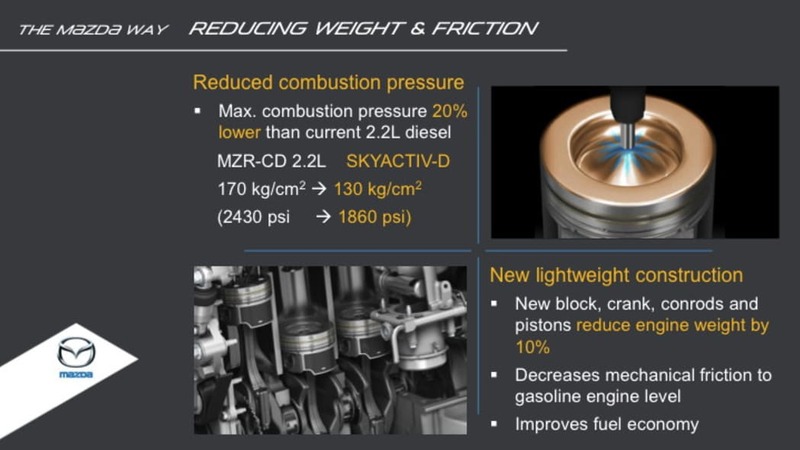 On top of these engine changes, every Skyactiv full model change will attempt to be 100 kilograms (220 pounds) lighter than the version it replaces, which is not an easy task. 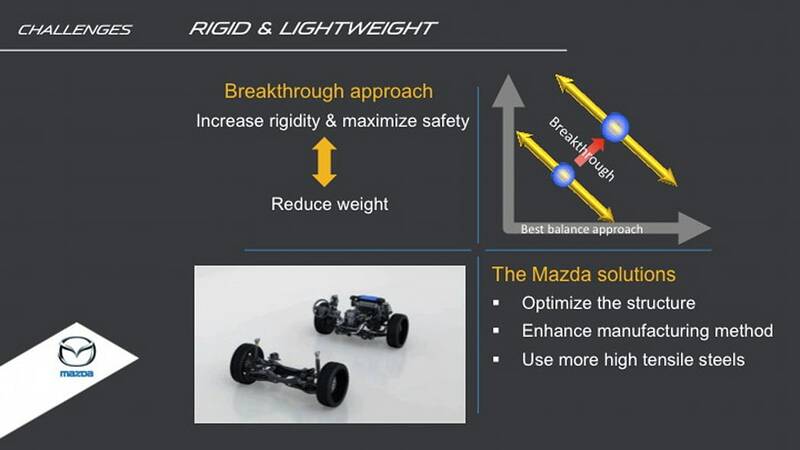 This harkens back to Mazda's "jinba-ittai" strategy used with a previous MX-5 (Miata) launch, where Mazda engineers were tasked with removing grams of weight from multiple parts. 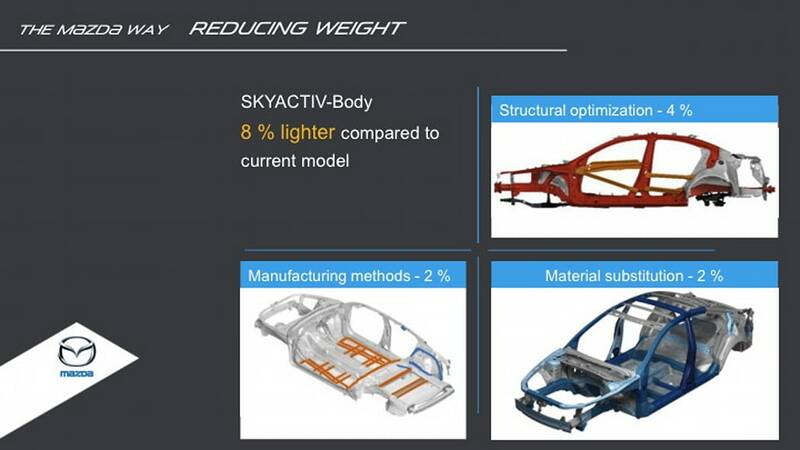 Skyactiv is this process writ large: take a kilo or two out of as many parts as possible and, viola, you've got yourself a model that's all of a sudden 220 pounds lighter. 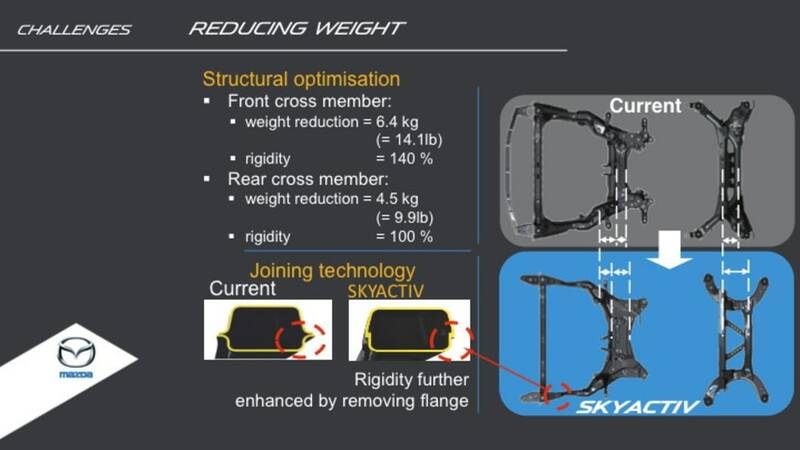 That's the idea, anyway. The challenge with the EPA city cycle is that there aren't enough full-stop moments to realize a testing advantage. 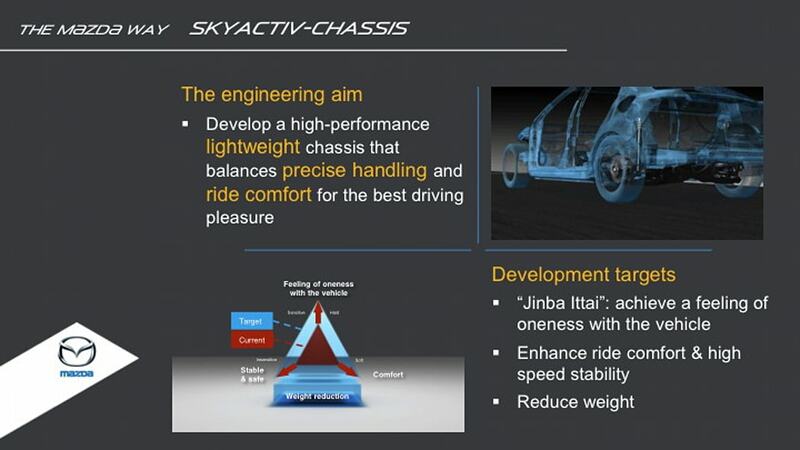 In real-world driving, you are going to see a benefit. 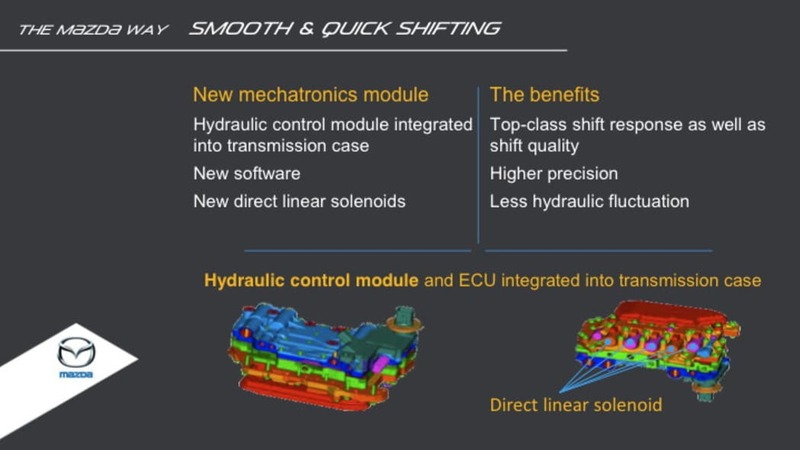 The way our system works is no electric drive, so you don't get engine-off coast, you don't get electric operation at low speed, it only helps when the vehicle is stationary. That stuff is not free. 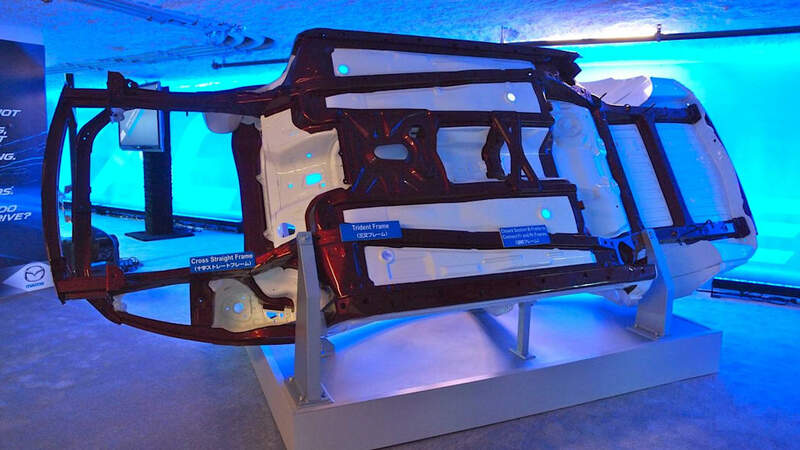 We can't just put technology into a vehicle and not expect some payback, at least not right now. Maybe as time goes on, as the cost of the technology comes down further. 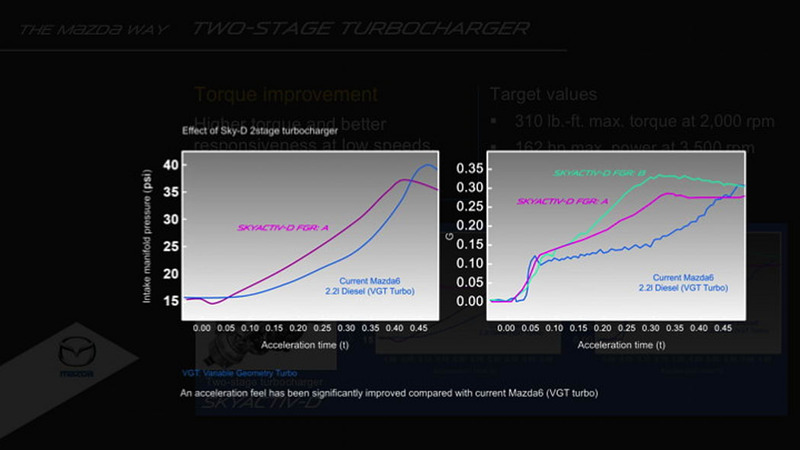 We have to find some way to show the customer that what we're charging them for, they're getting a benefit for. 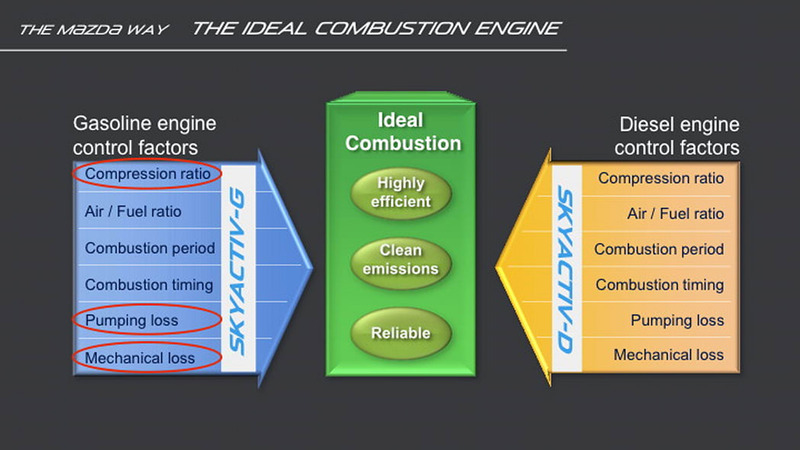 Shorter Barnes: we'll put in clean technology when it's right to do so, and not a moment before. It wasn't all talk in Vancouver. We also got to test out early, early versions of the Skyactiv package. 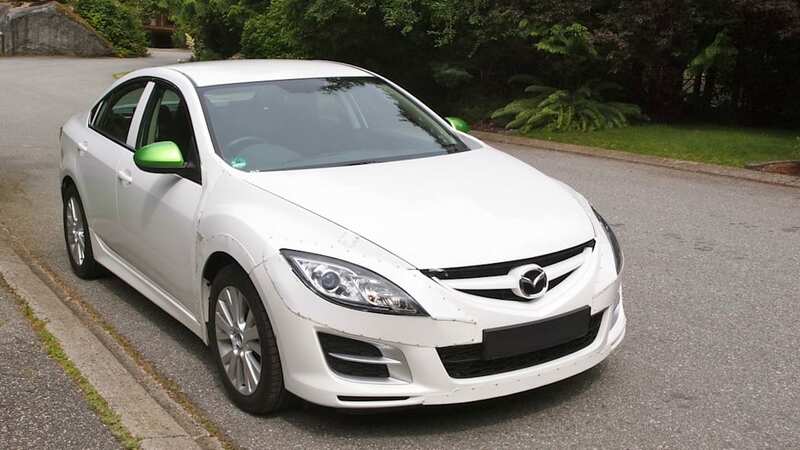 Behind the wheel, the Skyactiv vehicles indeed feel better – a bit more responsive, a bit quicker, a bit nicer – than the current-gen Mazda6s that we were comparing them against (a Euro-spec diesel manual and a Canadian-spec 2.5-liter gasser with an automatic transmission). 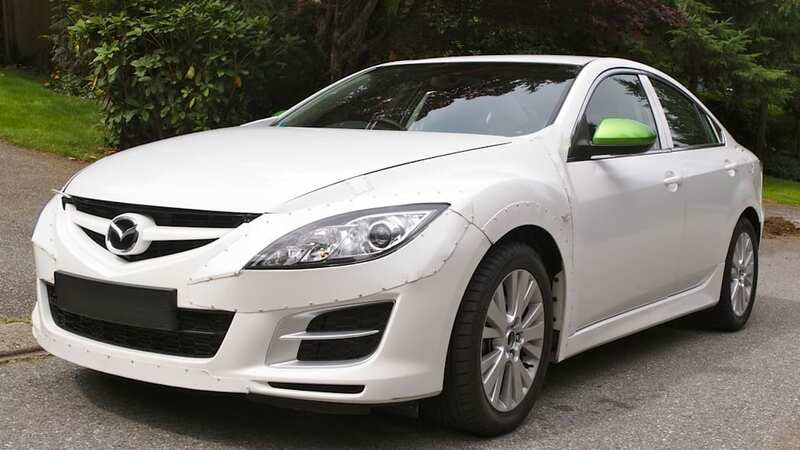 There are only eight or nine of these 6 mules in existence, and they're very rough. 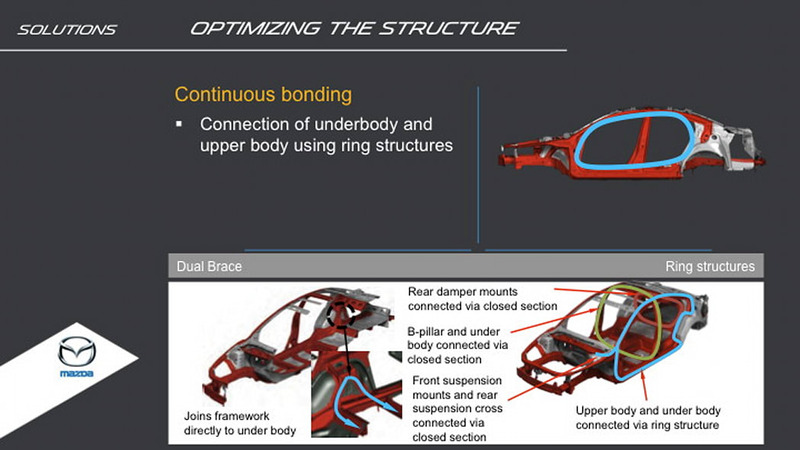 Mazda is further along with the CX-5 mule development that will debut early in 2012. 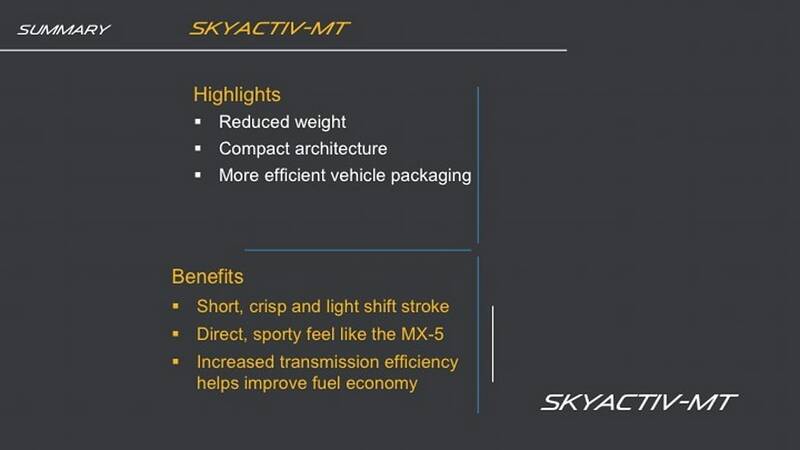 It's incredibly difficult to accurately compare the early mules we drove (which had all four parts of the Skyactiv technology available today inside the shell of a current 6). 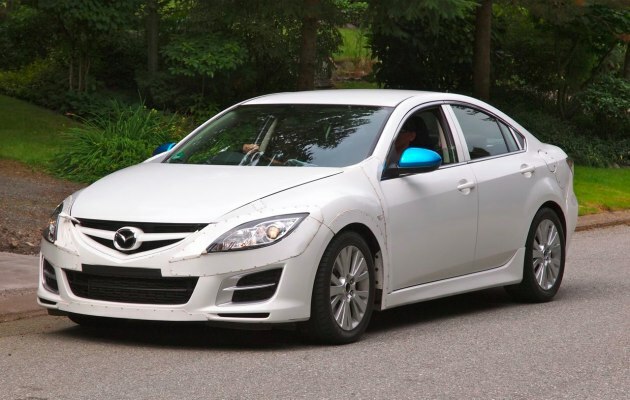 For one thing because they were right-hand drive models, so performing the mental gynmastics required to stay safe on the Vancouver highways meant our full attention could not be on the driving experience. 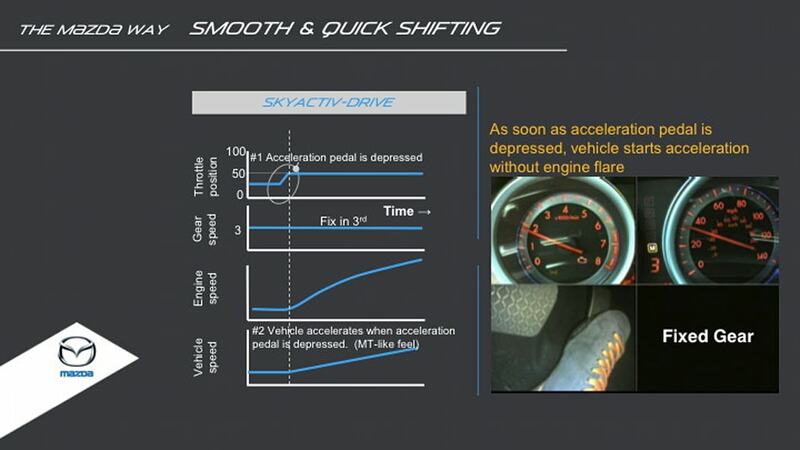 Still, it became clear that the Skyactiv-D with the manual transmission was the best of the bunch. 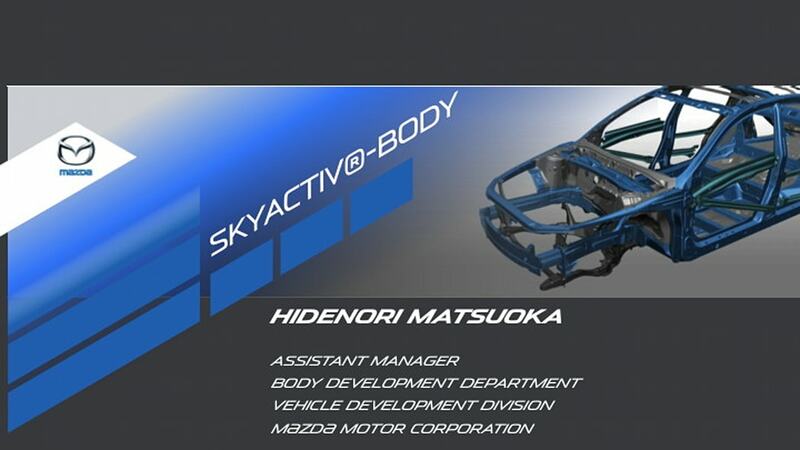 We're sure reasonable people will find their own favorite once the finished vehicles become available, but this is the situation today. 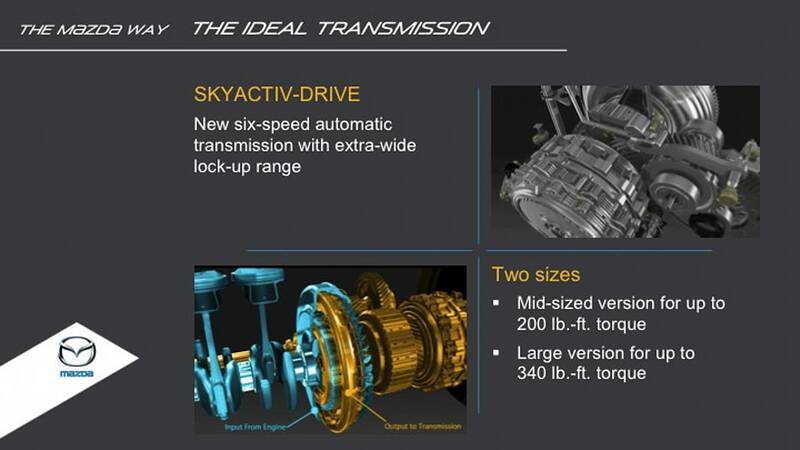 Let's go back to the four main Skyactiv components: engines, transmissions, body and chassis. 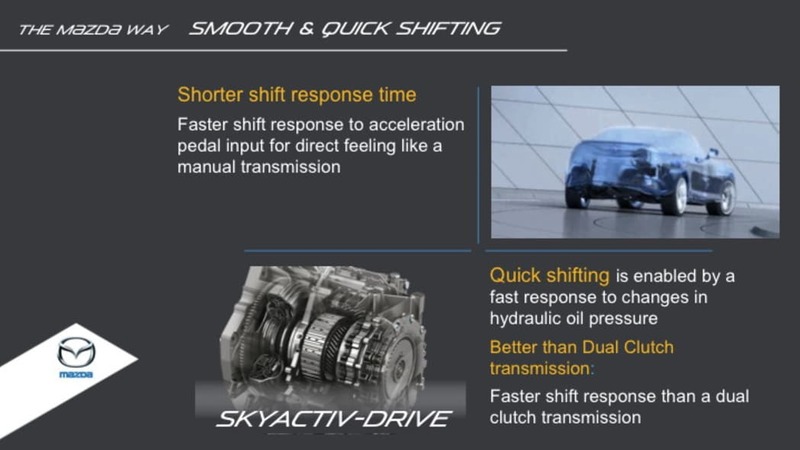 Mazda has been working for four to five years to put them together in completely new ways, starting with the first Skyactiv vehicle, the facelifted Mazda3 that comes out this October. 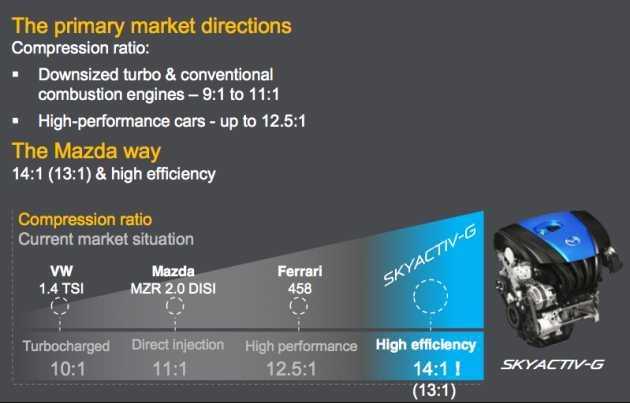 The new 3 gets the Skyactiv-G and the Skyactiv-Drive/MT bits, but not all four components. What's interesting here is that this first G will only have a 12:1 compression ratio, not the 13:1 that will be coming to the U.S. in the rest of the Skyactiv vehicles. 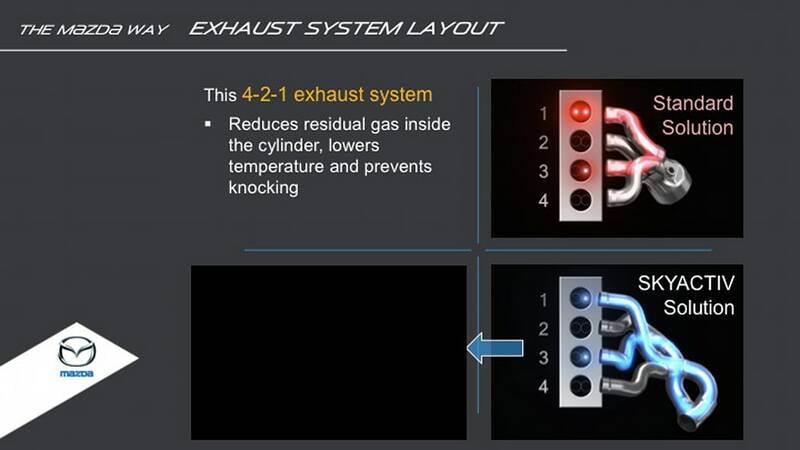 The reason for the 12:1 ratio is that the engineers could not package the Skyactiv-G's 4-2-1 exhaust manifold in the current 3 the way it needs to be to get 13:1. There just isn't enough room. 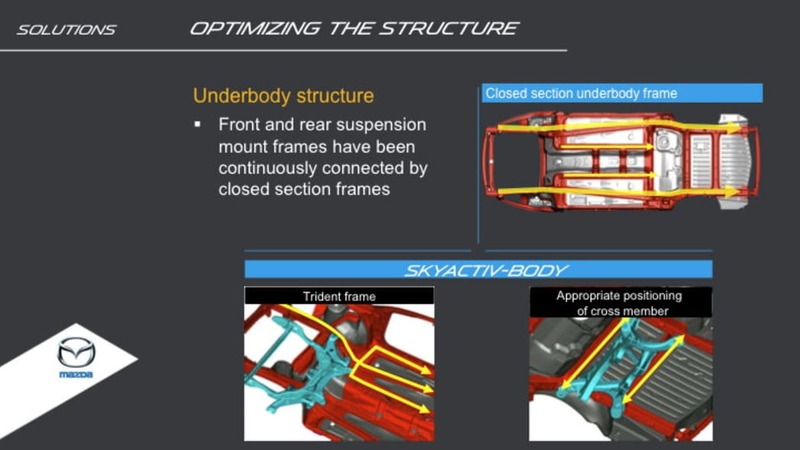 When the CX-5 comes out in the spring, it will be the first all-Skyactiv vehicle in the U.S., with the body and chassis and everything intended for Skyactiv technology through and through. Mazda is kind of teasing the market with the half-Skyactiv 3. Barnes said the car is being released in this way, "so we can show just what the engine and transmission technology alone can do. 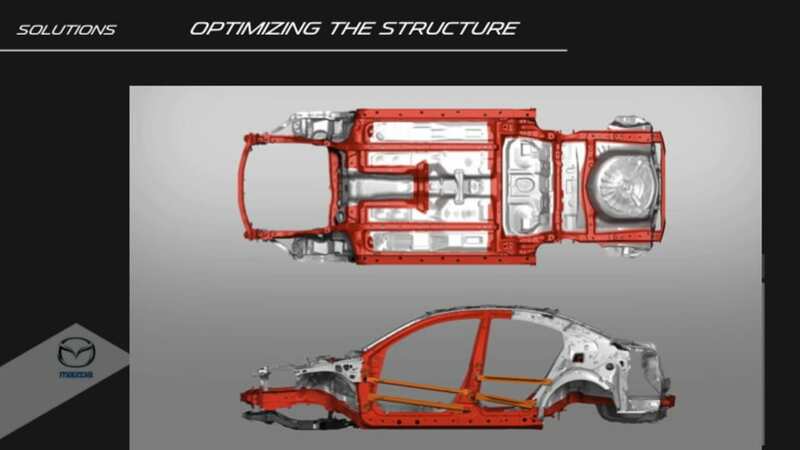 The new Focus, Civic, Elantra, Cruze are all purpose-built, new-generation vehicles and we've matched everything they've done, essentially, with only a half-generation change." 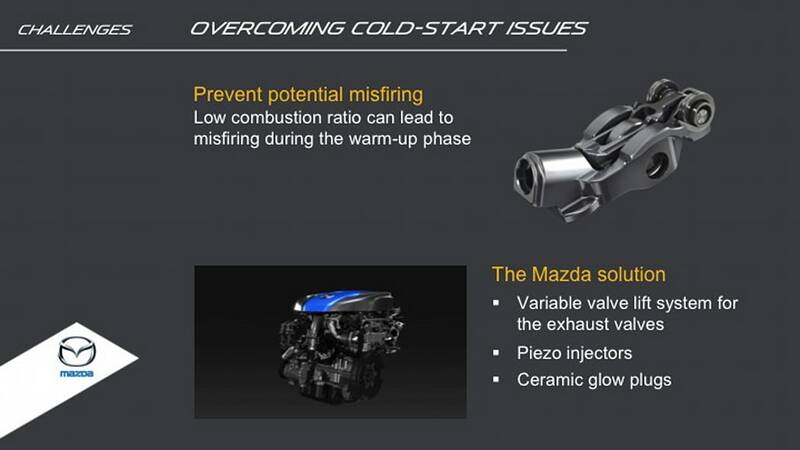 Mazda may be a year behind its rivals, but Barnes said the fuel economy improvement will be better than what those vehicles offer today. 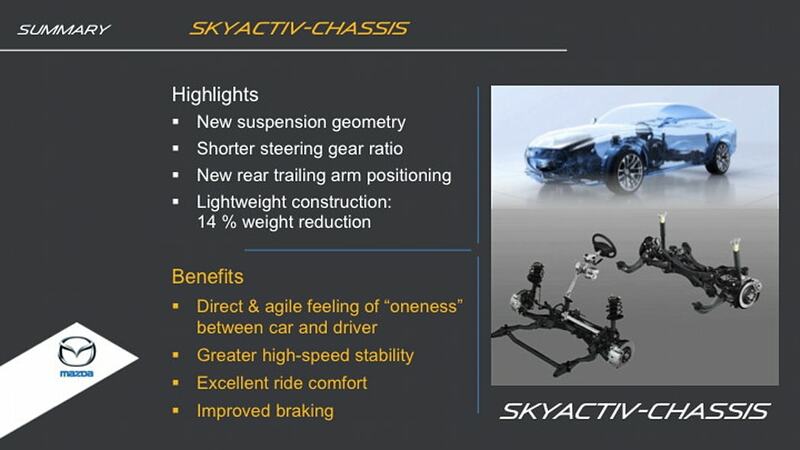 The Skyactiv vehicles will be more fun to drive, too, he said. 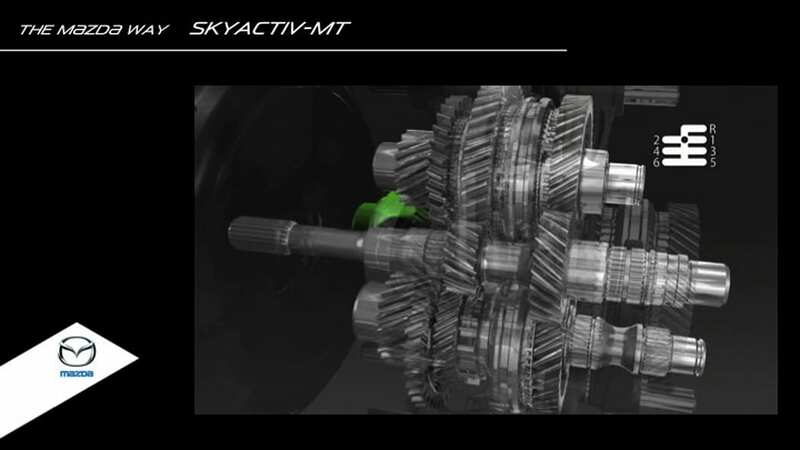 "That's where Skyactiv comes in. 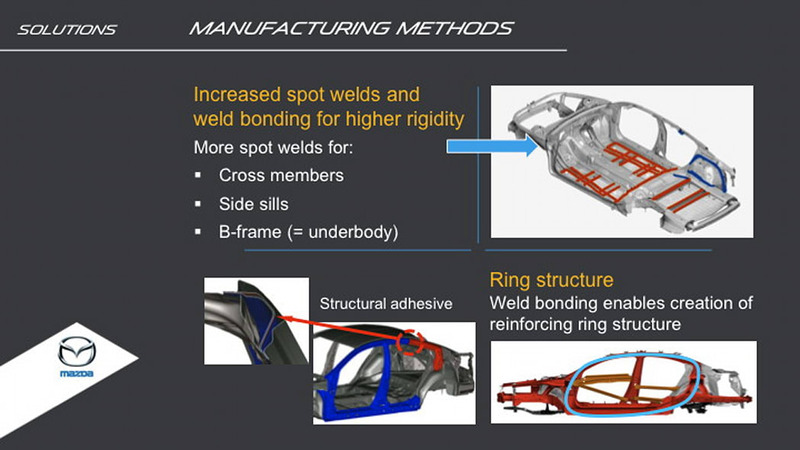 It gives us all the benefits and we're not forced into trade-offs." 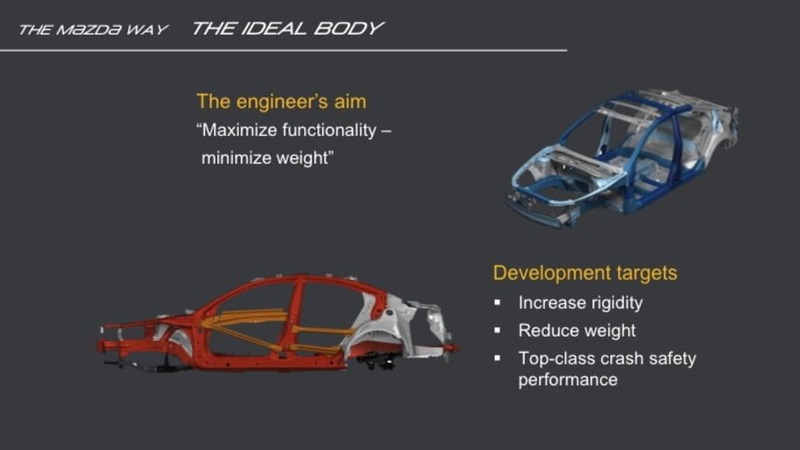 Look at the cars that are rated at 40 mpg or higher, Barnes said, then "see what people think of them to drive. 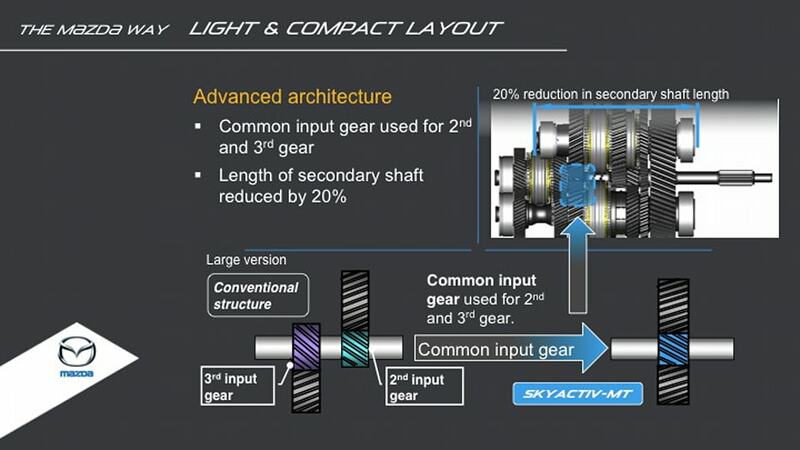 Transmissions are always two gears too high, hard tires are installed to make a package to get that number and steering feel goes out the window. 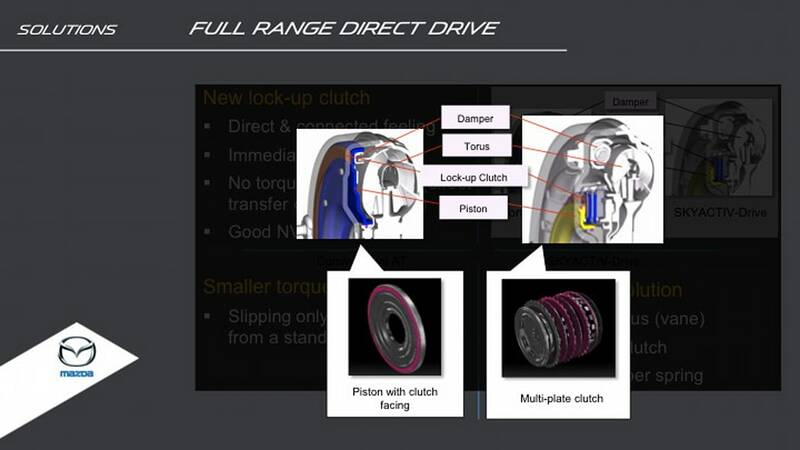 The drive experience goes out the window. 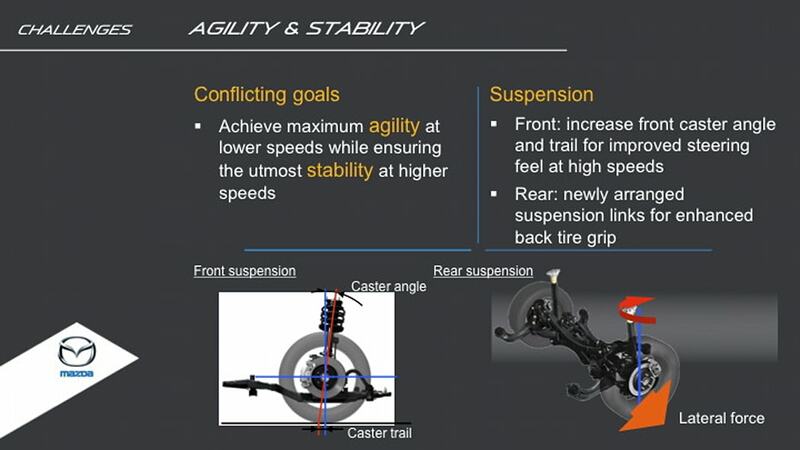 Road noise goes out because the tires are harder. 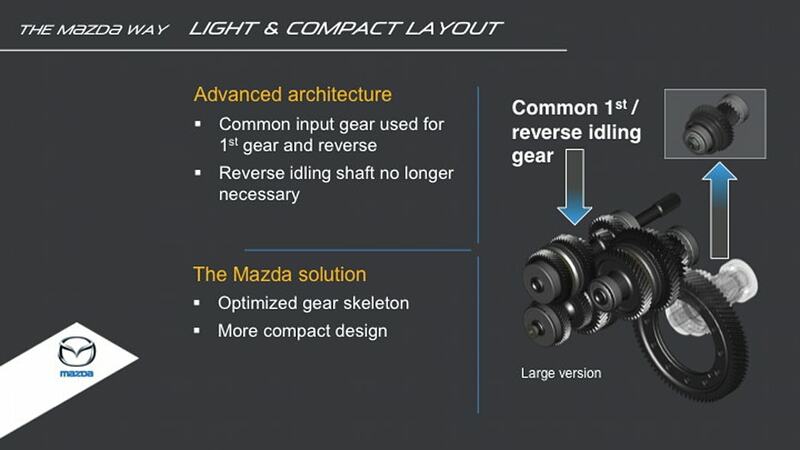 Those are compromises that Mazda is not willing to make. That's where Skyactiv comes in. 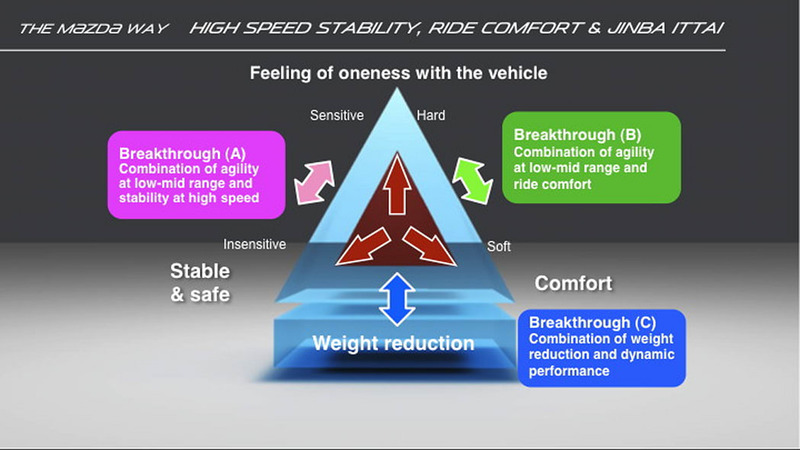 It gives us all the benefits and we're not forced into trade-offs." This sort of confidence was on full display in Vancouver. 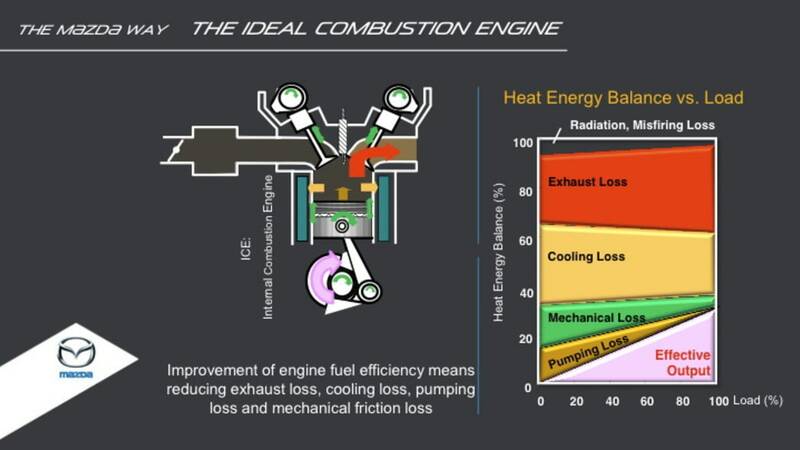 Following last week's announcement of the new CAFE standards for Model Year 2025, we had to ask if Mazda's ICE-centric strategy is good enough. 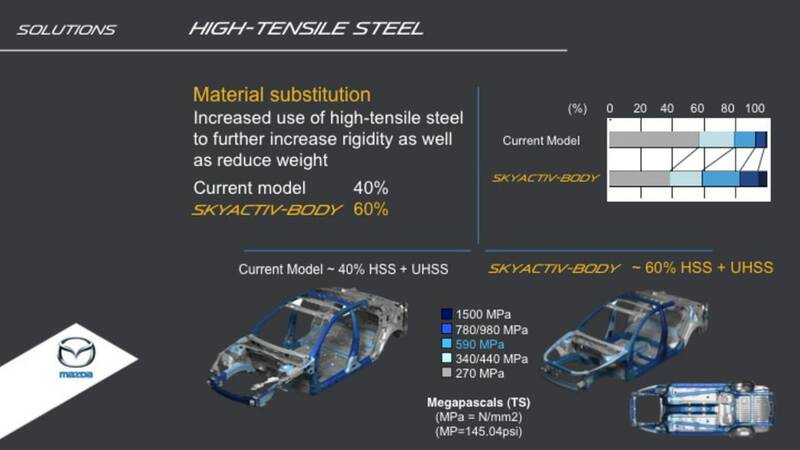 Barnes admitted that 54.5 is a "pretty gargantuan number, let's be honest about it. 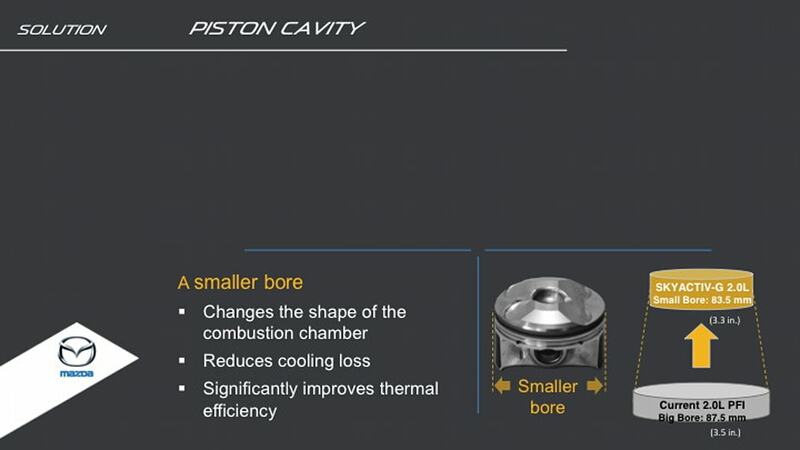 Can we meet it? 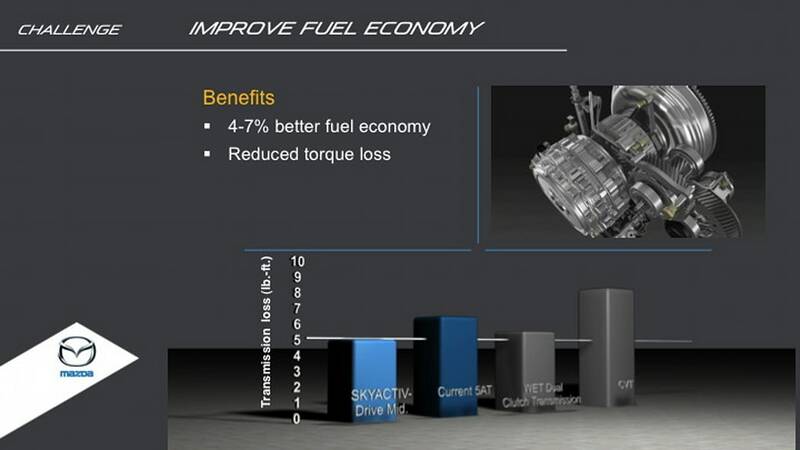 Yes we can." And here's where the little risk/big reward strategy comes it; a strategy that is so crazy it just might work. 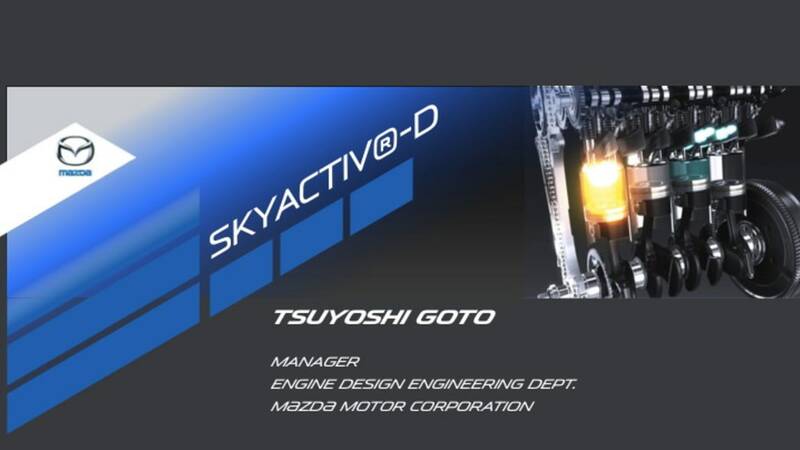 Kiyoshi Fujiwara, Mazda's executive officer, admitted to AutoblogGreen that Mazda will indeed need to add some sort of electrification (either a hybrid or full EV) to its lineup to meet the just-announced CAFE requirements, possibly even before that. 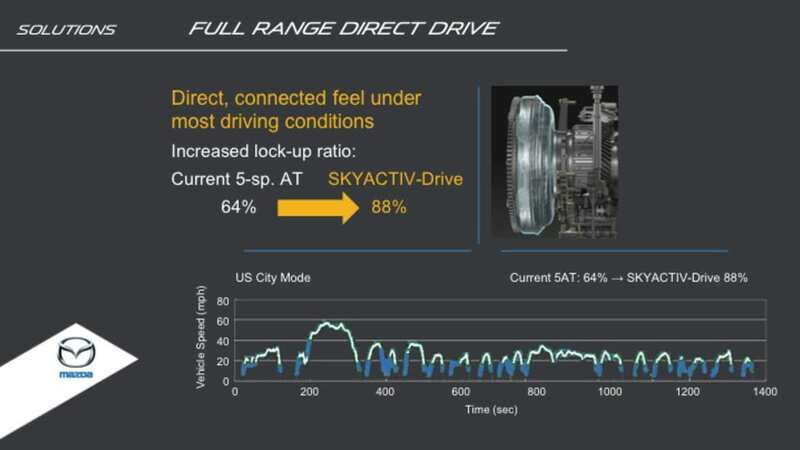 What's most interesting about Skyactiv is that the suite of technologies allows Mazda to push back the time when electrification becomes unavoidable, and this delay might just allow Mazda to enter the plug-in field at a much, much lower cost than other automakers. 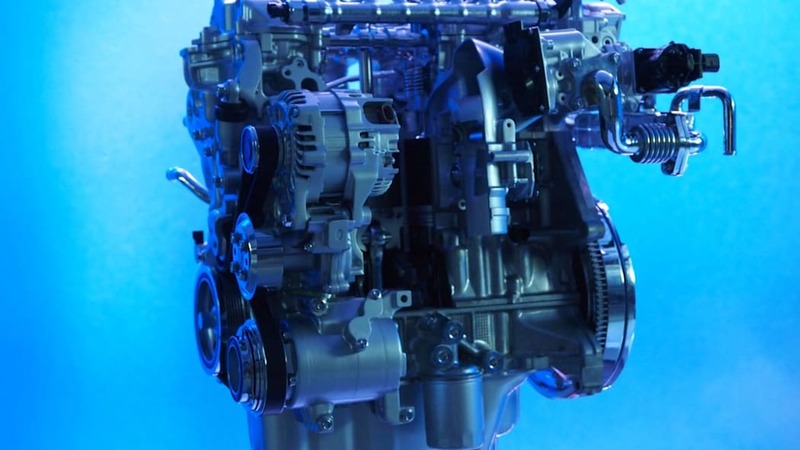 If Ford and GM and Nissan and Volvo and everyone else spends billions getting an EV supplier base established, and works to build out the infrastructure and teaches people how to use plug-in vehicles, then Mazda can swoop in in, say, 2015, and buy the parts it needs after economies of scale have kicked in and sell affordable EVs to a willing public. 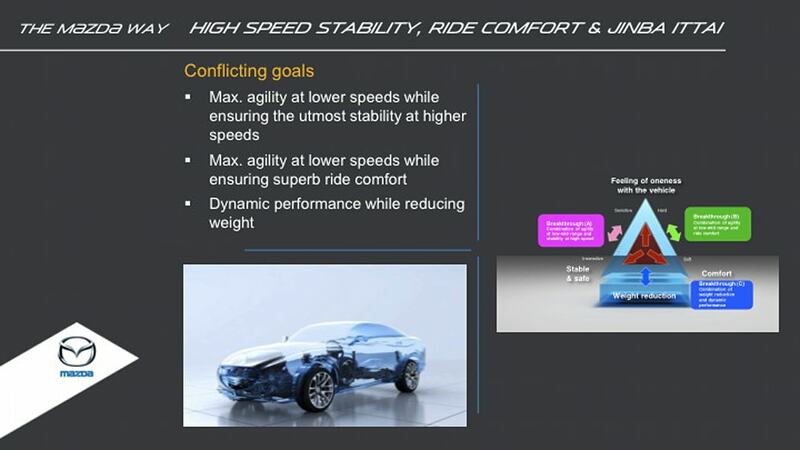 Right now, Mazda is getting ready to test a few hundred all-electric Demios (Mazda2s) in Japan, but this is more to gain institutional knowledge – to have questions and demands ready for suppliers – than it is to get ready to build an EV next year, Fujiwara said. With Skyactiv, Mazda is playing the long-term game. Things may look chaotic now, but there's a lot of time left before the buzzer sounds.